The Council of the Trireme Trust has decided, after some 35 years of investigation, research and publication that the time has come to cease activity and wind up the Trust. This decision has been taken with considerable regret and reluctance, but acknowledges that the Trust's raison d'être, Olympias, is no longer structurally capable of being used for experimental sea-trials, even though she continues to be maintained by the Hellenic Navy. The Trust warmly welcomes the fact that the ship still fulfils an important part of her intended role in educating the public about the ancient world, since she is still visited by thousands each year at the Battleship Averof Floating Naval Museum in Faliro, Greece (http://averof.mil.gr), and can be rowed by the general public on a number of open days. The Trust has now published all the sea trials undertaken between 1987 and 1994, together with a considerable body of further research based on the data produced by those trials; see most recently Trireme Olympias: The Final Report (Oxbow, Oxford, 2012), and the second edition of The Athenian Trireme (Cambridge University Press, 2000), which has now sold more than 5,000 copies worldwide. The Trireme Trust wishes to offer sincere thanks to all those who have over the years made the Trireme Project such a success, whether by researching, organizing, rowing or helping in a myriad of ways. The Trireme Trust was set up in 1982 by the historian and academic, John Morrison, naval architect, John Coates, and writer Frank Welsh to investigate a centuries-old controversy about the nature of the trireme, the most important warship of the ancient Mediterranean world. 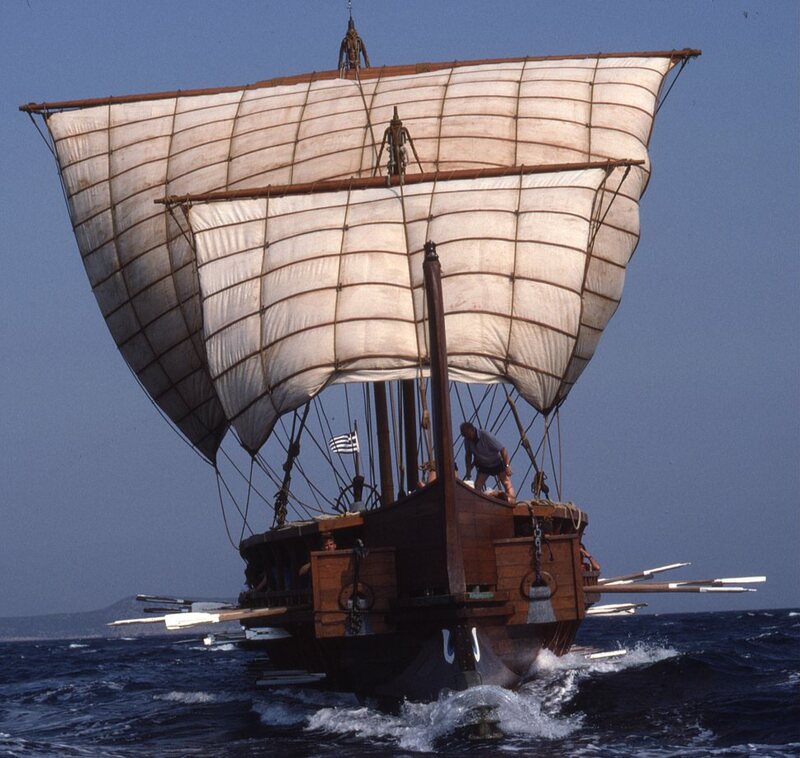 Their collaboration resulted in the building and launch in 1987 by the Hellenic Navy of a full-scale reconstruction, the Olympias, powered in accordance with the ancient evidence by 170 oars arranged over three levels. A series of six sea-trials between 1987 and 1994 demonstrated that the ship could be rowed efficiently and fast, despite almost universal academic opinion that a three-level arrangement of oars was wholly impracticable. A full-scale, sit-on model of the reconstructed oar system was featured in the Transport section of the Millennium Dome exhibition in 2000, and similar models are currently on display in both the Henley River and Rowing Museum and the Manchester University Museum. In 2004, the ship itself was used to carry the Olympic flame across Piraeus harbour shortly before the opening of the Athens Olympic Games. Since 1994, the Trireme Trust has been dedicated to disseminating information about the ship as widely as possible, through publications, lectures to schools and historical/archaeological societies, supply of photographic images, and television and press interviews, and to carrying out further research based on the sea-trials. The Trireme Trust archive includes all the relevant correspondence, design notes, construction drawings and sea trials documentation relating to the Olympias project. Ten years ago, the Trust's papers, including John Coates' original plans, were archived and catalogued, and until recently have generously been lodged in the River and Rowing Museum at Henley-on-Thames. In order to secure long term access to these valuable records and documents, the entire archive has now been transferred in perpetuity to Wolfson College, Cambridge, where John Morrison was founding President. Wolfson College Cambridge claims world copyright for all the materials whether textual or illustrative contained in the Trireme Trust Archive with the sole exception of material specifically attributed to another copyright holder. No material in the Archive may be reproduced without the prior written consent of the College. Wolfson College Cambridge is a Registered Charity no. 1138143.